X (2019), Reddymade’s winning design for the eleventh annual Times Square Valentine Heart Design Competition, explores how love emerges within communities where difference meets equality. An “X” evokes many expressions of interpersonal and civic love, including the written symbol for a kiss, and even the mark of a vote. People from all backgrounds cross paths in Times Square, and Reddymade’s design offers them a meeting point for further exchange and connection. Reddymade is an architecture and design firm that focuses on the economic, social, environmental, and cultural impacts of their work. Led by founder and architect Suchi Reddy, the firm’s approach traverses formalism and experimentation. Founded in 2002 by architect Suchi Reddy, Reddymade is a diverse architecture & design firm whose practice takes a human-centric approach to design, one that assesses the economic, social, environmental, and cultural impacts of its work on both people and planet. Working from her home country of India to her home base in New York city, with projects in Miami and Los Angeles, Reddy charts a course for all things Reddymade with a culturally specific, globally curious eye. X takes its titular form with two crossed aluminum planes, creating a passageway through or a snug meeting place within the 18-foot-tall structure. Round openings at the centers of the planes combine into heart shapes when viewed from different angles. X’s glowing light grows brighter as people gather underneath its intersection. 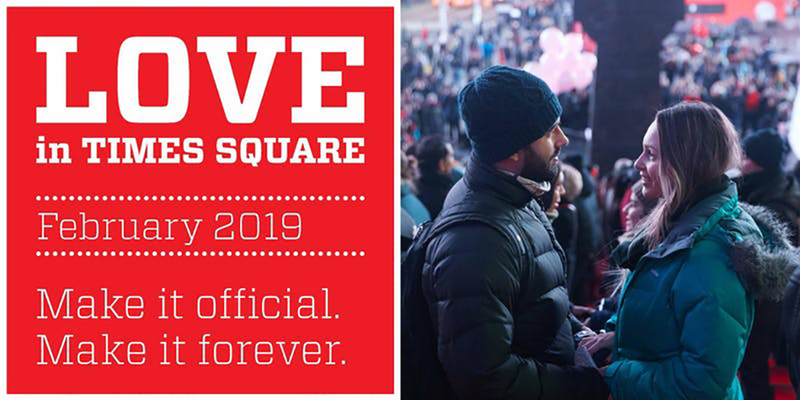 The Times Square Valentine Heart Design Competition is an annual invitation for architecture and design firms to submit proposals for an iconic public art installation that celebrates and communicates love in the heart of this dynamic city during the month of Love in Times Square. Times Square Arts collaborated with AIA New York on an open call for proposals for the 2019 heart design and an exhibition of the finalist submissions, on view from October 15—November 2, 2018 at The Center for Architecture. Read about the proposals from the seven other 2019 Times Square Valentine Heart Design Competition finalists here. X will be unveiled at Father Duffy Square on February 1st at 11am with sweet related programming ~ Want to renew your vows? 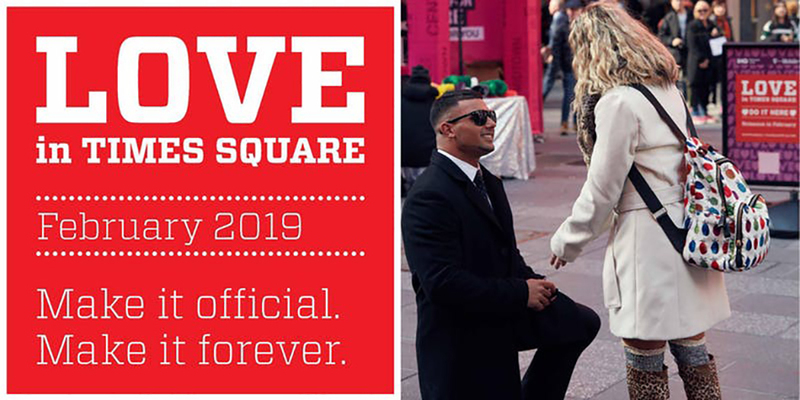 Times Square Alliance will host a large vow renewal ceremony at 6pm on the iconic glass Red Steps. Register for the ceremony right here. Looking for the perfect place to pop the big question? How about X on Valentine’s Day! X will be on view from February 1 to February 28, 2019 at 46th Street and Broadway. Check out the other finalists competing in the 2019 Times Square Heart Design Competition.